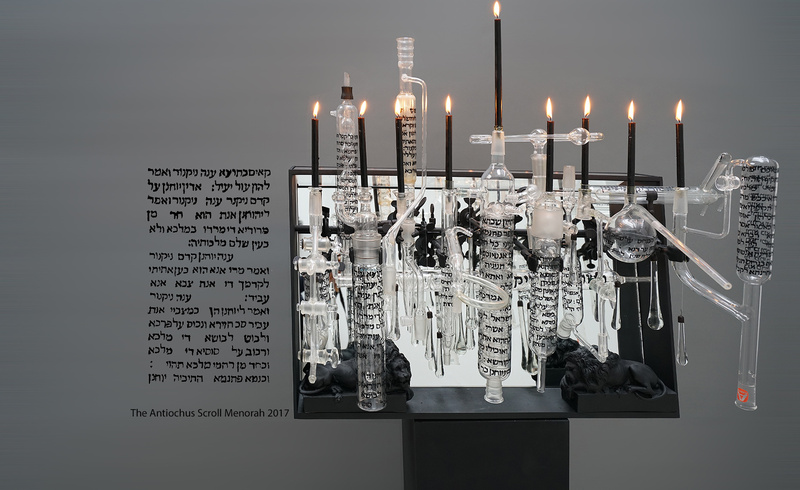 In a world where the pendulum of repression is swinging to the forefront, the narrative resonance of the menorah, a symbol of victory over oppression, expresses a relevance unbound by time, asking the viewer to contemplate our obligation to defend cultural freedom and to engender light in a time of darkness. In the most recently completed menorah in the studio’s Menorah Project, vintage laboratory tubes are engraved with 15th Century text from The Scroll of Antiochus—which recounts the story of Hanukkah, and in the Yemenite tradition is read in Aramaic each year during Hanukkah. This metaphorical dialogue connects the past and the present, spirituality and fortitude, the divine and humanity—and evokes the responsibility of the individual in the role of social vigilance. Reinterpreting the menorah as an assemblage sculpture, the ritualistic centerpiece of Hanukkah is transformed into an expression of the historical/spiritual significance of the Jewish revolt against the Seleucid tyranny, and invites a discourse between this ancient narrative and society’s current socio-political direction.